Background: End stage renal disease (ESRD) patients on maintenance hemodialysis undergo arterio-venous fistula (AVF) cannulation prior to each hemodialysis session for blood access. 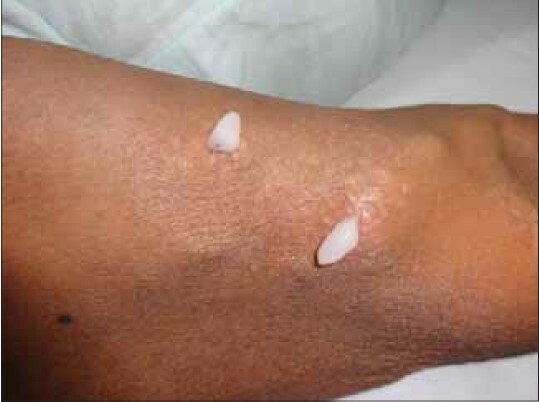 Prior to cannulation lidocaine infiltration is done, which is often perceived as painful. Eutectic mixture of local anesthetic (EMLA) has been found to significantly reduce pain associated with radial artery cannulation compared with lidocaine infiltration. Aims: To evaluate the efficacy of EMLA compared to infiltration of lidocaine in hemodialysis patients for AVF cannulation. Materials and Methods: A single-centre, crossover study of patients with an AVF on regular maintenance hemodialysis was performed in the dialysis unit of a tertiary care teaching hospital. The site of AVF, number of attempts for AVF cannulation and cannula insertion time were recorded. The patients were asked about the acceptability of application of the anesthetic, delay between anesthetic and cannulation and to score the pain on cannulation. Results: Fifty patients were included in the study. With the visual analog scale, pain score on infiltration was 4.8. Pain score on cannulation after topical application was 2.9 and after infiltration, 2.0. The number of attempts for cannulation and the cannula insertion time were similar. Anesthesia was more stressful in the injectable group rather than the topical group (P < 0.001). Delay between anesthetic and cannulation was unacceptable in the topical group (P < 0.001). Patient compliance was better during infiltration compared to topical (P < 0.005). Mean pain score during infiltration of anesthetic was significantly higher than cannulation pain after either anesthetic, although pain on cannulation was higher in the topical group (P < 0.001). Conclusions: EMLA offers a suitable alternative to lidocaine infiltration for patients using AVF for blood access. EMLA has not been compared to lidocaine infiltration for AVF cannulation. The aim of this study was to evaluate the efficacy of EMLA cream compared with infiltration of lidocaine in hemodialysis patients for AVF cannulation. This single-center, crossover study was conducted in the dialysis unit of the Department of Nephrology, Christian Medical College, Ludhiana, after institutional research committee approval, from September 2012 to March, 2013. The principal investigator recruited patients with an AVF on regular maintenance hemodialysis after obtaining a written informed consent. Patients were randomized into two groups, each starting with either the topical or injectable local anesthetic. Crossover between topical and injectable local anesthesia was performed a total of four times to eliminate memory bias. 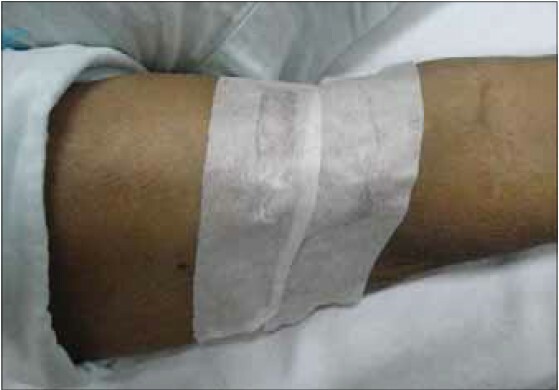 Patients were asked to apply a thick layer of topical anesthetic [Figure 1] under occlusion with a micropore tape [Figure 2] for one hour prior to cannulation. The fistula was accessed using a 16-guage needle. Subcutaneous infiltration of lignocaine was performed with a 26-guage needle. The site of AVF, number of attempts for cannulation, and cannula insertion time were recorded. The patients were asked about the acceptability of application of the anesthetic (on a scale of 1-10; where 1 was acceptable and 10 stressful), delay between anesthetic and cannulation (acceptability of delay between anesthetic and cannulation on a scale of 1-10; where 1 was unacceptable and 10 acceptable), and to score the pain on cannulation with the Visual Analogue Scale (VAS) (on a scale of 0-10; where 0 was not painful at all and 10 excruciatingly painful). Patient compliance was assessed by the principal investigator (noncompliance was scored as 1 and total compliance as 10). Presence of any erythema, irritation, or itching at the site of application of anesthetic was noted, as was wound infection at the puncture site on follow-up. Demographic data was collected from the patients' hospital records. Statistical analysis was performed using SPSS 16.0 (SPSS Inc., Chicago, Illinois, U.S.A). P < 0.05 was considered significant. Fifty patients were included in the study. The baseline demographic profile is depicted in [Table 1]. 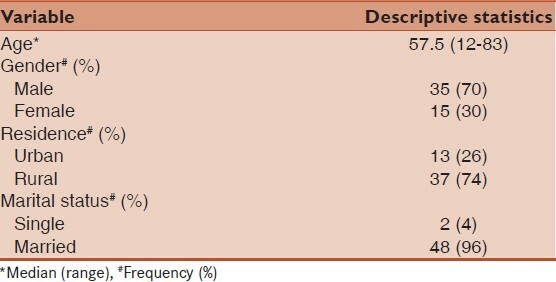 Twenty-seven patients (54%) were radiocephalic, while the remaining had brachiocephalic fistulas. Most of the patients were hypertensive, 22 (44%); 19 (38%) were hypertensive as well as diabetic. None of the patients who received EMLA required additional lidocaine infiltration. The number of attempts for cannulation and cannula insertion time were the same whether EMLA was applied or lidocaine infiltrated. On a scale of 1-10; where 1 was acceptable and 10 stressful, the mean score for infiltration was 6.4 and 1.6 for topical application. Anesthesia was more stressful in the injectable group rather than the topical group (P < 0.001). The mean score for acceptability of delay between anesthetic and cannulation on a scale of 1-10 was 4.7 for topical and 7.1 for infiltration. Delay between anesthetic and cannulation was unacceptable in the topical group (P < 0.001). With the VAS, pain score on infiltration was 4.8. Pain score on cannulation after topical application was 2.9 and after infiltration was 2.0. The number of attempts for cannulation and the cannula insertion time were similar, as mentioned in [Table 2]. No side effects to the topical EMLA were noted in any patient, namely erythema, irritation, or itching at the site of application. No patient had wound infection at the puncture site on follow up. Patient compliance was better during infiltration compared to topical (P < 0.005). Mean pain score during infiltration of anesthetic was significantly higher than cannulation pain after administration of either anesthetic, although pain on cannulation was higher in the topical group (P < 0.001). Native radiocephalic AVF is the preferred vascular access for hemodialysis. It is associated with the lowest risk for death, infections, and cardiovascular events compared to an arteriovenous graft or central venous catheter. An AVF is thought to be mature when it has a readiness for flow as well as cannulation. EMLA, when compared to placebo cream ,, or ethyl chloride vapocoolant spray,  has been shown to significantly decrease the pain associated with venepuncture during AVF cannulation. Anesthetic creams have been recommended to reduce pain and discomfort for fistula puncture in children. Our study included only a single child, who was a 12-year-old. It has been established that the use of EMLA doesn't interfere with the success of venepuncture or venous cannulation,  similar to that found in our study. Tetracaine, liposome-encapsulated tetracaine, and liposome-encapsulated lidocaine were found to be at least as efficacious as EMLA. Topical anesthetics are thought to be under-utilized, despite their equal efficacy compared to lidocaine infiltration,  owing to their slow onset of action and inconsistent effectiveness. However, we found that additional infiltration of anesthetic was not needed in any of our patients, and it was effective in all our patients after one hour of occlusion. Side effects with EMLA are rarely reported, which include irritation  and allergic contact dermatitis. None of our patients had any side effects to the EMLA cream. In a randomized controlled study, EMLA was found to significantly reduce pain associated with radial artery cannulation compared with lidocaine infiltration and improved the success rate of the cannulation. Success rate of AVF cannulation was unaffected in our study. The application of anesthetic was significantly more stressful in the injectable infiltration group rather than the EMLA group. Delay between anesthetic and cannulation was found to be significantly unacceptable in the EMLA group, so, patient compliance, as assessed by the physician, was better during infiltration of anesthetic compared to EMLA. Mean pain score during infiltration of anesthetic was significantly higher than cannulation pain after either anesthetic even though pain on cannulation was slightly higher in the EMLA group. The buttonhole (constant site) AVF cannulation technique, in which the inserted needle utilizes exactly the same site and the same angle every dialysis session, was found to be less painful than the traditional method;  this technique was not used for our study. Topical anesthesia with EMLA (combination cream of prilocaine and lidocaine) has shown to have comparative efficacy and acceptability as compared to injectable lidocaine with no side effects. Pain on lidocaine infiltration is more than that on cannulation of the AV fistula with either modality and stressful for the patient. Delay in cannulation as a result of EMLA cream application and occlusion was a drawback, reducing patient compliance for the EMLA cream. EMLA offers a suitable alternative to lidocaine infiltration for people undergoing maintenance hemodialysis using AVF for blood access. Ms. Paramdeep Kaur (for technical and statistical help). 1. Jindal K, Chan CT, Deziel C, Hirsch D, Soroka SD, Tonelli M. Canadian Society of Nephrology Committee for Clinical Practice Guidelines. Hemodialysis clinical practice guidelines for the Canadian Society of Nephrology: Vascular Access. J Am Soc Nephrol 2006;17:S16-27. 2. Ferguson C, Loryman B, Body R. Best evidence topic report. Topical anaesthetic versus lidocaine infiltration to allow closure of skin wounds in children. Emerg Med J 2005;22:507-9. 3. Joly LM, Spaulding C, Monchi M, Ali OS, Weber S, Benhamou D. Topical lidocaine-prilocaine cream (EMLA) versus local infiltration anesthesia for radial artery cannulation. Anesth Analg 1998;87:403-6. 4. Kundu S, Achar S. Principles of office anesthesia: Part II. Topical anesthesia. Am Fam Physician 2002;66:99-102. 5. Buckley MM, Benfield P. Eutectic lidocaine/prilocaine cream. A review of the topical anaesthetic/analgesic efficacy of a eutectic mixture of local anaesthetics (EMLA). Drugs 1993;46:126-51. 6. Ravani P, Palmer SC, Oliver MJ, Quinn RR, MacRae JM, Tai DJ, et al. Associations between hemodialysis access type and clinical outcomes: A systematic review. J Am Soc Nephrol 2013;24:465-73. 7. Donnelly SM, Marticorena RM. When is a new fistula mature? The emerging science of fistula cannulation. Semin Nephrol 2012;32:564-71. 8. Watson AR, Szymkiw P, Morgan AG. Topical anaesthesia for fistula cannulation in haemodialysis patients. Nephrol Dial 1988;3:800-2. 9. Wehle B, Björnström M, Cedgård M, Danielsson K, Ekernäs A, Gutierrez A, et al. Repeated application of EMLA cream 5% for the alleviation of cannulation pain in haemodialysis. Scand J Urol Nephrol 1989;23:299-302. 10. Çelik G. Vapocoolant spray vs lidocaine/prilocaine cream for reducing the pain of venipuncture in hemodialysis patients: A randomized, placebo-controlled, crossover study. Int J Med Sci 2011;623. 11. Fischbach M, Edefonti A, Schröder C, Watson A. European Pediatric Dialysis Working Group. Hemodialysis in children: General practical guidelines. Pediatr Nephrol 2005;20:1054-66. 12. Schreiber S, Ronfani L, Chiaffoni GP, Matarazzo L, Minute M, Panontin E, et al. Does EMLA cream application interfere with the success of venipuncture or venous cannulation? A prospective multicenter observational study. Eur J Pediatr 2013;172:265-8. 13. Eidelman A, Weiss JM, Lau J, Carr DB. Topical anesthetics for dermal instrumentation: A systematic review of randomized, controlled trials. Ann Emerg Med 2005;46:343-51. 14. Houck CS, Sethna NF. Transdermal analgesia with local anesthetics in children: Review, update and future directions. Expert Rev Neurother 2005;5:625-34. 15. Pérez-Pérez LC, Fernández-Redondo V, Ginarte-Val M, Paredes-Suárez C, Toribio J. Allergic contact dermatitis from EMLA cream in a hemodialyzed patient. Dermatitis 2006;17:85-7. 16. Sukthinthai N, Sittipraneet A, Tummanittayangkoon B, Vasuvattakul S, Chanchairujira T. Buttonhole technique better than area puncture technique on hemostasis and pain associated with needle cannulation. J Med Assoc Thai 2012;95:S208-12.